His personal relationships had failed. His career tracks had dead-ended. Now his health was threatened. Neale Donald Walsch, at age 48, was financially destitute and in a state of chronic depression. From this low place of frustration and desperation, Neale vented his ire by writing an angry letter to God on a yellow legal pad. At the end of an almost hysterical writing frenzy, near physical and emotional collapse, he was unable to release the pen from his hand. He heard a voice over his right shoulder, a real voice that frightened him. Then the voice moved inside Neale's voice head, and he wrote what the voice said. What had begun as a private process in February 1992 thus became a dialog with an infinite source, which Neale later identified as a conversation with God. Conversations with God, the movie, is the dramatic story of Neale Donald Walsh's passage from being poor and homeless to becoming the messenger of spiritual truths that have impacted people worldwide. Book One of the Conversations with God series stayed on the New York Times Bestseller list for more than two and a half years and has been translated into 36 languages, with more than 7 million copies sold. A decade after the appearance of Book One, Conversations with God, the movie, began shooting November 7, 2005, in Ashland, Oregon, where the actual events of Neale's transformation occurred. Finally, the full back story of Neale's struggle is revealed in a feature-length film produced and directed by Stephen Simon, who is responsible for such spiritual cinema classics as Somewhere in Time and What Dreams May Come and for the launch of of the modern-day spiritual cinema movement. 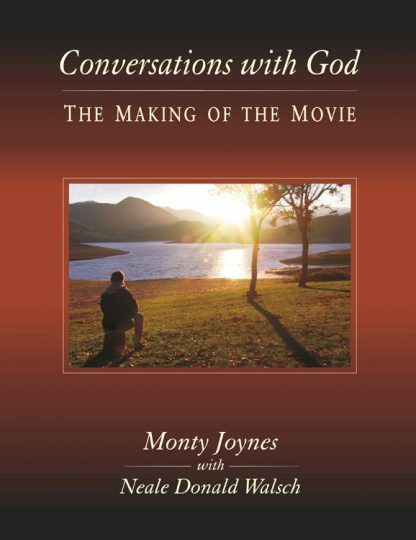 Conversations with God: The Making of the Movie provides a unique and exclusive insight into the process and personalities involved in the spiritually relevant film genre that has become known as spiritual cinema. The narrative text connects the film's storyline to the remarkable synchronistic events that linked all cast and crewmembers. From pre-production to the location sets, in more than 200 full-color production stills, production design works of art, and frames from the movie itself, here is the heart of filmmakers at work. And since Neale Donald Walsch lived these dramatic movie events, who better to comment on them from the personal depth of his experience? Throughout the book, Neale adds a commentary dimension unprecedented in moviemaking literature. All this combines to make Conversations with God: The Making of the Movie a touchstone document in the evolution of conscious moviemaking now recognized as spiritual cinema.